My apologies to Tom Leher, who scribbled much better lyrics for “Pollution” - but the tune keeps running around in my head. Especially today as the PA Department of Environmental Protection begins reconsidering some air quality exemptions. 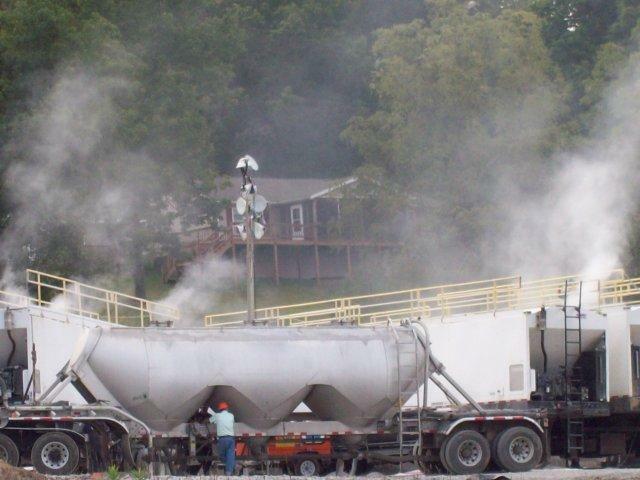 In response to requests from the Marcellus Shale gas industry, the DEP has proposed re-opening or rescinding three technical guidance documents that limit air pollution. Go to Bradford County’s gas information page and you’ll see an animated map of natural gas development since 2009. 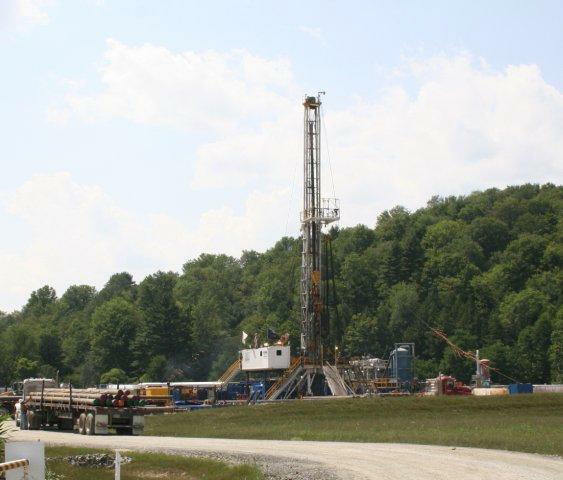 Estimates peg the number of Marcellus wells that will be drilled in PA in the tens of thousands. Each well by itself may not be a major source of air pollution, but combined they can have a significant impact on the air we breathe. And that is the problem – that air quality standards don’t take cumulative impacts into account. Not in PA. Not in NY. Heck, here in NY the Department of Environmental Conservation (DEC) won’t even consider air quality as an issue when developing regs for high-volume horizontal slickwater hydro-fracking. When we think about fracking problems we think about spills, blowouts, methane migration and chemicals leaching into drinking water. 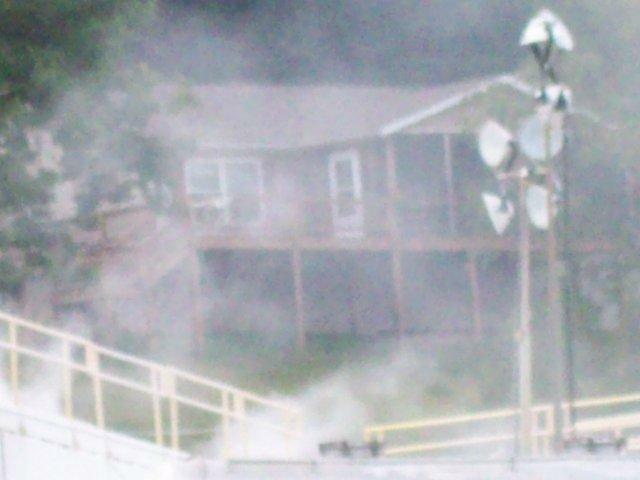 Fracking chemicals pollute the air, too. One of the most widely used chemicals in fracking cocktails is methanol – a hazardous air pollutant and a candidate for regulation under the Safe Drinking Water Act (SDWA). It was a component in 342 hydraulic fracturing products listed in the Congressional Committee on Energy and Commerce report released last month. But Methanol wasn’t the only air pollutant - nearly 600 of the 750 products listed in that report contained a total of 24 different hazardous air pollutants, including hydrogen fluoride and lead. Then there’s fracking sand, tiny grains of sand or ceramic that help “prop” the fractures open so gas can migrate into the wellbore. Unlike regular-sized particulates, frack sand can be very fine – maybe even “ultra-fine”, a designation for particles less than 100 nanometers. These extremely tiny particles escape our respiratory cleaning system- they’re not swept out of the bronchi by cilia or trapped in mucus. Instead, when breathed in, they go into the alveoli (the tiny air sacs at end of bronchioles) and pass directly into the blood stream. Even if the material itself is not toxic, exposure to ultra-fine particles induces respiratory diseases and may exacerbate cardiovascular problems (such as stroke and other inflammatory responses). Over 20,000 deaths each year are linked to air pollution – and many are due to ultra-fine particles that cause stroke and interfere with pacemakers. Air pollutants have been linked to premature birth and lower birth weight, which further impact the health of children and increases risk for lung diseases. 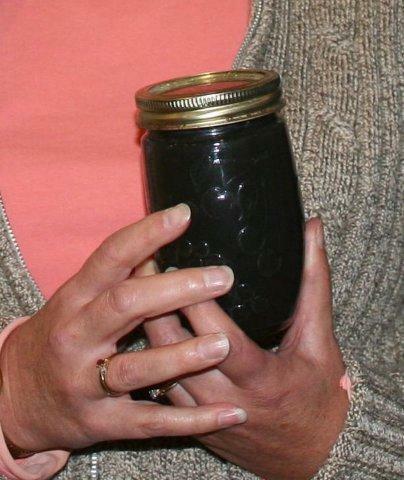 How many drinking water wells are contaminated in PA? That's a good question, says attorney Todd O'Malley, a partner in the "Marcellus Shale Oil & Gas Litigation Group". There are a lot of families with drilling-related water contamination that the PA Department of Environmental Protection (DEP) doesn't know about, he said in a phone conversation earlier this afternoon. And there are a lot of PA state legislators who have little idea of just how many wells in their areas have been affected by methane migration and other problems due to drilling. 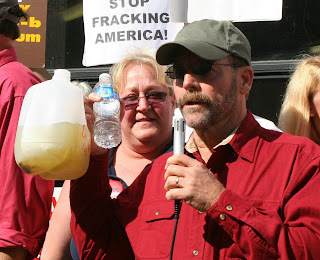 For that reason O'Malley and his partner, NY attorney William Friedlander are passing free sample bottles - they want people to fill up the bottles with water from contaminated wells, attach a label telling where the water comes from, and give it to them for delivery to Harrisburg on June 7 - Lobby Day. Our idea, says O'Malley, is that we can deliver contaminated water samples from constituents to their elected representatives. "We want to make it visual - something they see every day to remind them of the people they represent," he said. Maybe if they see it they will act. Good idea, this "visual representation" thing. Only one tiny niggling thing bothers me: today's press release went out with bold red headlines advertising that the legal group is distributing "Free Local Contaminated Water Kits". Granted, it also said in that same bold typeface that those kits were to pressure legislators to advocate for safer oil and gas drilling practices. But within a couple hours of the press release at least three reporters called to confirm that, NO, these are not Water Test Kits. They are "kits" only in that the bottle comes with instructions on how to fill it, said O'Malley. The water will not be tested, he clarified. It is simply for use as a visual aid to demonstrate the number of homes where people can no longer drink their water. "If people have reason to believe their water has been contaminated by drilling, they need to contact the DEP," he said. So, if you've water that's turned smelly, flammable, discolored or otherwise yukky since drilling began in your area, you know where to send it. Nearly two weeks ago NY Assemblywoman Barbara Lifton sent a letter to Governor Andrew Cuomo asking him to temporarily halt the Supplemental Generic Environmental Impact Statement (SGEIS) process. Her reason: The SGEIS is flawed and inherently inadequate. There are too many issues - including cumulative impacts, wastewater treatment and disposal, and health issues – that were excluded from the initial scoping document. “We need to fix it,” Lifton said. She wants the governor to pause the SGEIS process for 30 days to allow the public to comment. Sixty-three of her colleagues from both houses and both sides of the aisle have added their signatures to the letter – but so far, no response from the guv. Given the increased salts and other pollutants that have ended up in Pennsylvania streams, we need increased state and federal oversight in wastewater disposal. Given new data on methane emissions from gas drilling and production, we need to consider the entire life cycle of unconventional drilling. Given that conventional drilling in NY has not brought increased economic benefit to those counties, when compared to non-drilling areas, we need to have better economic studies. Given that public health concerns were given short shrift in the original scoping document, they need to be covered more fully. Add to Lifton’s list one more item: concern that landowners trying to buy or sell their leased properties may not be able to obtain financing. This week Walter Hang (of Toxics Targeting) sent his own letter to the governor asking that Cuomo expand the SGEIS to include leasing and property concerns. Drilling might reduce property value. That has already happened in other states, especially in neighborhoods where water has been contaminated. Neither FHA nor HUD will finance property where there is surface and/or subsurface activity within 300 feet of a structure or property line. Activity within 200 feet prevents most other conventional financing. Whether drilling qualifies as a “commercial venture” and thus would void title insurance. Given the number of emerging concerns - things that were intentionally excluded from consideration in the SGEIS - asking for a time out to gather comments and extend the scope is not an unreasonable request. On the heels of the recently released Duke study about methane migration linked to fracking comes this very clear, very funny song that makes everything .... frackin' clear. Between the Duke study and the focus on fracking on NPR yesterday (Science Friday), there's a lot of attention on potential health impacts of this new application of hydraulic fracturing techniques used in shale gas drilling. Now NY Assembly members want to know more. So they're holding a hearing on Thursday, May 26. Both the NY Assembly Standing Committee in Environmental Conservation and the Assembly Standing Committee on Health will conduct a public hearing on Health Impacts of Hydraulic Fracturing Techniques. In their announcement they note that "there are a number of concerns regarding the potential health effects of exposure to such chemicals". This hearing will examine those potential health effects. Oral testimony will be accepted by invitation only. The assembly members will accept written testimony as well. To submit testimony fill out a "public reply form" found below the hearing notice. Keep in mind that you'll need to send multiple copies if you present oral testimony. Legislative Office Building in Albany, NY. Earlier this week PNAS published a study that documents a link between hydraulic fracturing and water contamination. A team of Duke researchers showed that water wells located close to active drilling sites had methane levels 17 times higher than water wells located further away. Their definition of active drill site: within 3280 feet of a well. The scientists tested 68 drinking water wells in the Marcellus and Utica shale drilling areas in northeastern Pennsylvania and southern New York State. They measured dissolved salts and other constituents (carbon, boron and radium) as well as methane levels. The average methane concentration in drinking water was high enough – over 28 milligrams per liter (mg/L) – to qualify for hazard mitigation as recommended by the US Office of the Interior. But some water had much more methane – up to 64 mg/L. Though the researchers did not find evidence of fracking chemicals in the water wells, they expressed concern for that they see is a clear correlation between drilling activity and methane migration into drinking water. The presence of methane demonstrates that pathways do exist for migration of other potential contaminants. Even more interesting were the recommendations they made in a White Paper accompanying their study. Initiate a medical review of the health effects of methane. Create a national database listing methane, ethane and propane concentrations in drinking water. Find out how methane is getting into drinking water, say the scientists. 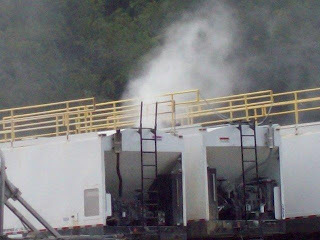 Is methane contamination due to poorly constructed well casings? Or is the process of fracking creating pathways for methane and other chemicals to migrate to the surface? Develop better estimates for greenhouse gas emissions of methane associated with shale gas extraction. Conduct extensive baseline water testing prior to exploration and drilling. They recommend testing water at least 3,000 feet from well sites and that testing be conducted by independent state-certified labs. Better study of waste treatment. For drilling fluids going to wastewater treatment facility, regulators need to understand how much of the chemicals are removed in the waste treatment plants and what are the long-term ecological effects downstream. Regulate fracking under the Safe Drinking Water Act (SDWA). Fully disclose chemicals used in hydro-fracking. Over the last two years NY landowners, tired of fraudulent pressure tactics used by landmen to get people to sign leases, appealed to the Attorney General. One company, Fortuna (Talisman) agreed to halt those practices. But Chesapeake refused, and this week a Towanda, PA landowner shared a letter received from a landman representing the energy company. 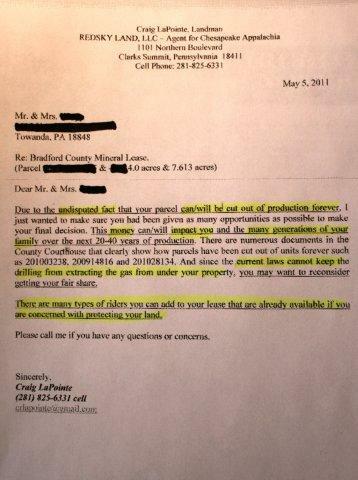 The landowner has, over the past three years, refused to lease his mineral rights to any gas company. 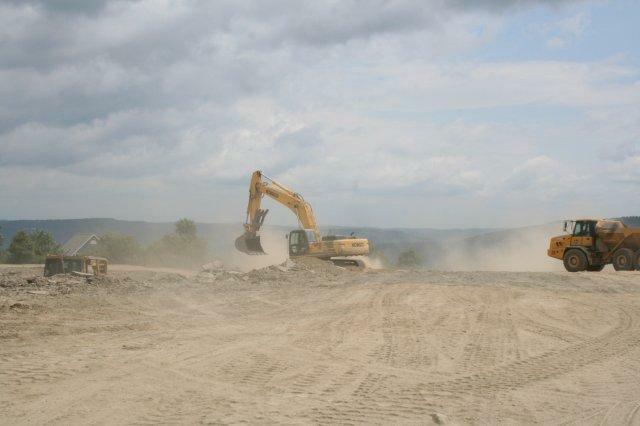 But on May 5, landman Craig LaPointe from Redsky Land LLC, “agent for Chesapeake Appalachia” sent yet another letter, one using language clearly meant to intimidate the landowner into signing a lease. “Due to an undisputed fact ... your parcel can/will be cut out of production forever,” LaPointe wrote. He explains that he wants to make sure he is giving them “…as many opportunities as possible to make your final decision.” Of course, he mentions that the money would impact the landowner and many generations to come. 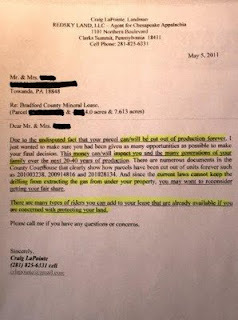 Remember, this letter is addressed to a PA landowner. They don’t have compulsory integration or “forced pooling” in that state, so the drillers can’t go under their property. Though they can drill right on the border and fractures “could” extend hundreds of feet under unleased land because – hey – they can’t control exactly where those fractures go, right? After listing two parcels that, he says, have been cut out of units forever, LaPointe ends his letter by reminding the landowners that “There are many types of riders you can add to your lease that are already available if you are concerned with protecting your land.” While he signs off with a helpful offer to answer any questions and concerns, the tone of the letter is … bullying. It’s tough love time here in Marcellus Country. The attorney general of Maryland is suing Chesapeake for polluting the river, Dimock residents are suing Cabot for polluting their water wells and a couple weeks ago the minority members of the congressional committee on Energy and Commerce released a report identifying 750 or so of the hazardous and toxic chemicals drillers inject into the ground. Now, to make matters worse, 160 or so uppity upstaters (Broome & Tioga counties, NY) are suing Chesapeake Energy and Statoilhydro for extending their gas leases wa-a-ay beyond the expiration dates. Over the past two years Chesapeake – and other energy companies – have been mailing letters to landowners stating that the state’s delay in issuing permits for horizontal shale drilling constitutes “force majeure”. This is baloney. When included in a contract a “force majeure” clause excuses a party from fulfilling its contractual obligations due to unforeseen events beyond its control. Such events include natural disasters such as floods, hurricanes, and other “acts of God” as well as terrorist attacks, civil unrest and acts of war. Except for the tornado ripping a swath from Erin to Danby last week, and the occasional flood, we haven’t seen force majeure-worthy events in our neck of the woods. However, Chesapeake’s “force majeure” clause in their gas lease tries to cover all the bases. It protects the gas company when their work is “prevented or delayed by such laws, rules, regulations or orders, or by inability to obtain necessary permits, equipment, services, material, water, electricity, fuel, access or easements, or by fire, flood, adverse weather conditions, war, sabotage, rebellion, insurrection, riot, strike or labor disputes, or by inability to obtain a satisfactory market for production or failure of purchasers or carriers to take or transport such production, or by any other cause not reasonably within Lessee’s control…” [language from actual leases filed in Broome County]. The only problem is … no one is stopping Chesapeake – or anyone else – from drilling wells in New York. And, as so many industry geologists keep pointing out, we have “a stacked play” here in NY. That means lots and lots of layers to drill. Of course, if they really want to conduct high-volume horizontal hydraulic fracturing in shale, they can. All they have to do is file the appropriate environmental impact studies. But, as one Talisman spokesman said a couple years ago, that takes money.